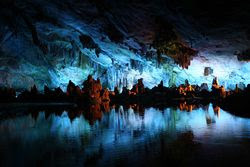 Guilin is a city in China, situated in the northeast of the Guangxi Zhuang Autonomous Region on the west bank of the Lijiang River. Its name means "forest of Sweet Osmanthus", owing to the large number of fragrant Sweet Osmanthus trees located in the city. The city has long been renowned for its unique scenery. In 314 BC, a small settlement was established along the banks of the Li River. In 111 BC, during the reign of Emperor Wu of the Han Dynasty, Shi An County was established, which could be regarded as the beginning of the city. In 507 AD, the town was renamed Guizhou. 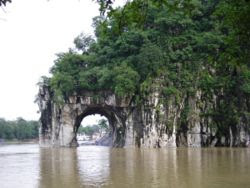 In 1921, Guilin became one of the headquarters of the Northern Expeditionary Army led by Dr. Sun Yat-sen. In 1940, the city acquired its present name. In 1981, this ancient city was listed by the State Council as one of the four cities (the other three being Beijing, Hangzhou and Suzhou) where the protection of historical and cultural heritage, as well as natural scenery, should be treated as a priority project. The Jingjiang Princes City is a royal complex dating from the Ming Dynasty that lies near the center of modern Guilin.